The United States is home to its fair share of famous bridges, big and small. 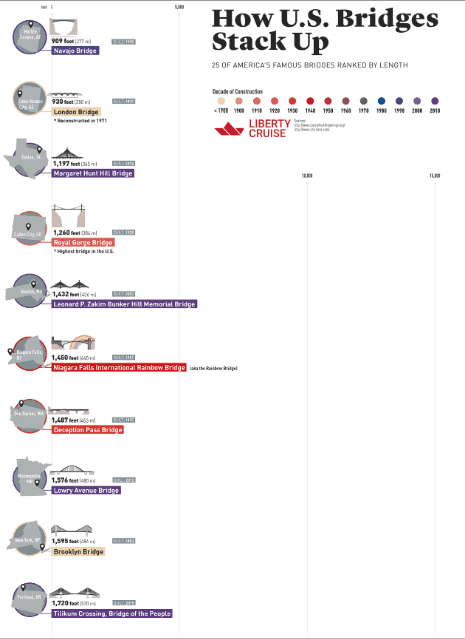 While some of these bridges are famous for their history or their height, this infographic from LibertyCruise.nyc will be focusing on another physical aspect of them, their lengths! Twenty-five well-known bridges throughout the United States have been ranked by their impressive lengths. The shortest bridge is the Navajo Bridge in Arizona, which crosses over the Colorado River and reaches a length of 909 feet. The longest bridge, the Lake Pontchartrain Causeway, is 139 times longer at a whopping 126,060 feet or 23.83 miles in length. The infographic also shares fun facts about these famous bridges. One fact is that the London Bridge, now located in Arizona, was actually relocated from London after it had started falling down, hence the popular song “London Bridge is Falling Down”. Ten of the bridges shown reach lengths of over a mile, with many having 4 to 7 miles of length. What’s the longest bridge you’ve driven on?